Some folks knit, some crochet or tat. Well, I choose knotting and this is hardly surprising since such a skill will naturally complement my bead and jade obsessions.Its only surprising that I have come to it so late. I tried to pick it up a few years ago with little success but this time round I have been more determined. 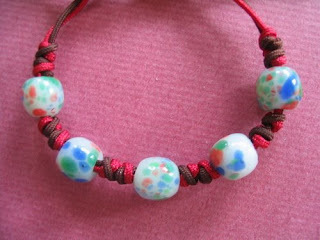 I am not gifted at handwork so its really taken a lot of dogged perserverance and practice to get the hang of knots. I have always admired those beautifully knotted and strung strands in books or on the net, and kicking myself to see why I cant do it like any other ordinary mortal. Finally, after much gnashing of teeth, here is my first finished project. The bracelet shown above is strung and knotted together with the Double Connection Knot which is a basic knot for beginners. Still my thumby fingers had to put in oodles of practice before getting the knot straight. The beads are Chinese glass beads circa 19-20th Century and look not unlike beads featured on p58 of Collectibe Beads by Robert K Liu. An unexpected bonus about practicing basic Chinese knots (not the complex ones mind you) is that it is quite relaxing and is the ideal in-between-activity while waiting for my family members who are always less than punctual for outings ! I call it knot therapy and it actually keeps me from getting mad. And also, call me corny, but it satisfies my hunger for making things as opposed to eating things :) Knotting is also kinder to elderly eyes than most other craft work. The double connection knot used here looks especially good when made in contrasting colors of red and brown as shown in my example. The crumb glass beads are old Chinese glass beads sometimes called Peking glass beads. Creeper knots are easy to make and look cute. 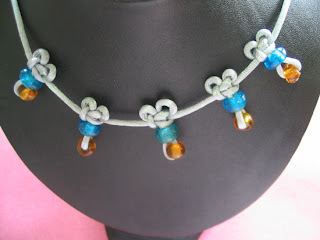 They can also be adapted to hold beads to make a quaint necklace. 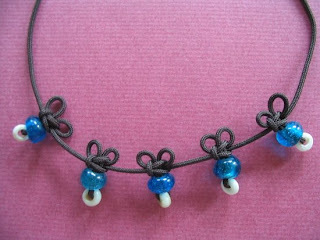 Another creeper knot necklace knotted on thicker cord. The beads shown are old Chinese glass in monochrome colors circa 19th century thereabouts.